While both academic and public libraries have started to grapple with the burgeoning issues associated with self-published books, many difficulties remain. To develop effective policies and procedures, stakeholders must now tackle questions associated with the transformation of the publishing landscape. Obstacles to self-publishing include the lack of reviews, the absence of cataloging and bibliographic control, proprietary formats for e-books, and the difficulty for vendors in providing these works. As the term “traditional publishing” begins to fade and new content producers join the conversation, librarians, publishers, and vendors will play an important role in facilitating and managing the shift. Robert P. Holley is a professor at the Wayne State University School of Library and Information Science. He is a recognized expert in collection development. After having been a library administrator—including head of collection development—at two large research libraries, he has taught collection development since 1993 to thousands of students. His teaching has given him a broader understanding of collection development in all types of libraries. He has over 150 publications, including five edited books and multiple conference presentations. His current focus is on intellectual freedom and on emerging trends in self-publishing, the out-of-print book market, and scholarly communication. He writes a column for Against the Grain where he often takes contrarian views on current issues. 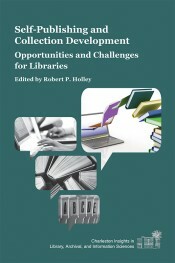 Holley is a frequent speaker at the Charleston Conference and also has been active in the American Library Association.